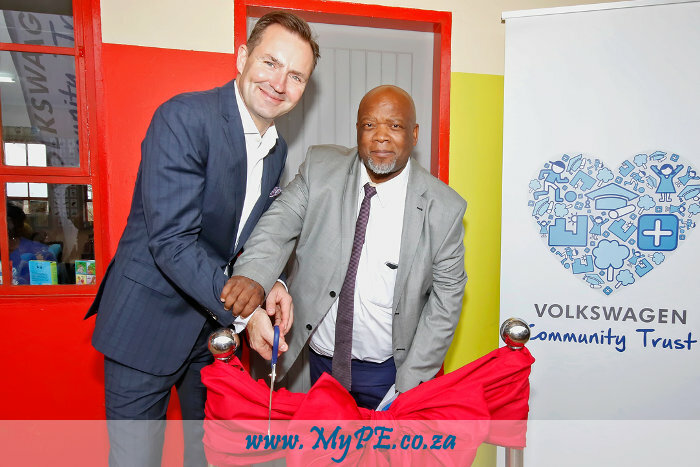 As part of the legacy of making sure that all learners in Uitenhage are functionally literate by the end of Grade 3, the Volkswagen Community Trust opened the first Literacy Centre in Uitenhage. The aim of the centre, located in Ntlemeza Primary School, is to provide structured literacy support to learners, teachers and parents. “At Volkswagen we strive to make a real difference in the community, that is why we support Early Childhood Development and are so committed to the VW Community Trust Legacy Literacy Programme”, said Thomas Schaefer, Chairman and Managing Director of Volkswagen Group South Africa. Volkswagen has spent over R600 000 at Ntlemeza to date, this includes a revamp of the Grade R Classrooms, the establishment of literacy centre and a brand-new netball court. Going forward, Volkswagen will be responsible for all the operational costs of the centre. The literacy centre will ensure that all at risk learners at Ntlemeza Primary school are identified early and then given daily structured support by well-trained volunteers and literacy practitioners. Six volunteers have been contracted to the centre already and their work is already showing results. At the handover of the centre, Themba Kojana, Head of Department for the Eastern Cape Department of Education, commended the partnership between Volkswagen, Shine and the education department and committed R7.9million to Ntlemeza Primary School for security, bathroom, electrical and building renovations. In September 2015, the VW Community Trust (VWCT) launched the legacy Literacy Programme with the Minister of Basic Education Angie Motshekga, where Volkswagen made a commitment to ensure that all learners in Uitenhage are functionally literate by the time they reach Grade 3. Being functionally literate means that a learner can read and write with meaning at a reasonable pace. As part of this audacious goal, VW consulted with key NGOs in the sector, universities and academics, the department of education, parents, teachers, School governing bodies and the community at large on the best way to approach this task. Research indicates that more than 60% of South African children cannot read for meaning by the end of Grade 3, so in 2016, Volkswagen working with Rhodes University and Professor Lily Pretorius (a renowned expert in the field of early literacy development) designed and conducted a baseline survey in seven schools in KwaNobuhle, Uitenhage. “We realised that the only way to overcome the key challenges in Education is through collaboration, partnership and commitment to these five focus areas. That is why VWSA spends 80% of our CSI Budget in Education.” said Thomas Schaefer.